Smirking as a rope like bakudo surrounded him, holding him in place so that movement was impossible. Suddenly everything went dark, he wasn't sure if he had completely lost his eye sight or if it was because of the hado being used on him, all he knew was that a great amount of power was surrounding him. Without knowing it the black box closed in an unleashed it's destructive for on him, still he was left virtually unharmed, there were many marks on his skin, but that could easily be fixed.. The fire once again removes all damage that had been done to them. "Not bad at all, but that's still not enough... he said with disappointment, he's been loosing a lot of his spirit, he'd have to take some time off to rest, maybe avoid conflict afterward. He didn't want to admit it but even his subclass immortality had it's limits. With his sword in hand he butterfly kicks in the direction of Jin's spiritual pressure, at the end of his acrobatic jump he sends out a wave of fire in his direction. Jinjako watched as the wall of fire came at him, He held up the Blue sword and the fire blast hit. A small bubble of water enveloped jinjako. Junkan- This ability is one almost never used because of what it does. Before the name is called out, Jinjako must use some of his blood. Weither he must cut himself or from a cut made by an enemy. After this, the sword begins to be covered in red water. it veins out into the area around him at a rapid pace. if touched by the water, it will attach itself to you and sink into your skin. give slight control over the muscle or some reiatsu control. "You know, I don't really think you're listing." He said with an even more disappointed voice. "You completely went backwards. 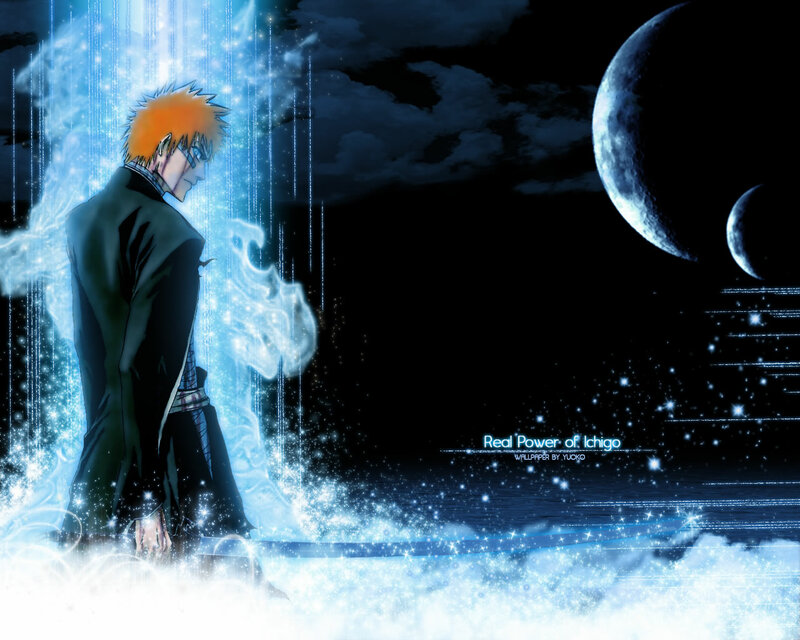 he said, loosing hope in his power, perhaps he ran out of kido, now he was reverting back to his bankai's ability. Bored with his trainer his attention drifts off into space, paying no mind that he was being attacked anymore. Feeling too lazy to continue standing he plants both hands behind his head and falls to his back, allowing his day dream to grow stronger. The area around him was covered in fire as usual. He felt a different presence, one that was equally as strong as he was, but it wasn't Hiru. "Who are you, friend or foe?" He asked, sure enough, a person resembling him appeared from a hidden area. "I'm umm... More than just a friend, I'm a fragment of yourself." He spoke in a shy manner. "And I'm not alone..." With that, four more people appeared, each with there own kind of posture, one being familiar. "Well, now the whole family is here!" Hiru said with a smile on his face, so that's what he had in mind when he said there was something he had to do. "What did you do..." He asked annoyed, unsure how to handle the arrival of new people. "Try not to think to hard, jr." A muscular guy said in a confident voice, this fragment was fairly strange. He seem to be trying to play the role of a cool person as well. Suddenly everything began to shake violently as fire shot from the ground intensely. "Who are these people!?!... And what are they doing in my domain!?" Asura yelled from his throne, suddenly the group got their knees except for Rensaku. "I only know Hiru, I don't know everyone else." He said. "How can you not remember them, especially him?" He pointed to the shy one who hid behind the guy who hadn't said anything yet. "You there, who are you." "Don't worry about me, Im pretty cool." He said in a calm, almost distant voice, he then walks toward the throne where Asura sat. "You don't want to go up there, he only allows me at his throne. The guy looks at him for a moment, then continues, going up the stairs. "He won't even know I'm there." He said, about thirty seconds later he hears hollering then sees the guy somersaulting toward the lower level of the domain. "Won't even know you're there huh?" He asked folding his arms, he knew what was coming, "Now what are you going to do?" "Don't worry, I have a plan." He said, it annoyed him that he was so relaxed. "I doubt it's going to work." He leaned to the side as he went up again, this time he tried to sneak his way up, only to be sent back down again. "Ok, that plan failed but I have another." He said as he rushed up the stairs with his sword in hand and fire covering his arms as well as his hands. "You just don't know when to quit." He said as he charged up the stairs behind him, his blade was completely covered in fire. As he shunpoed to the top he was met by Asura who delivered a fire punch to his face, knocking him out of the air. Recovering he flipped right side up and spun, kicking both him and the new guy. "It's been a while." Asura spoke, shooting fire at both of them, the fire explodes on impact, but it wasn't strong enough actually do anything. Using the hilt of his blade the guy he now called Uetseji attacked him while kicking the other fighter. Asu responds with a spinning kick that knocks both of them back down the stairs. As they both stood up he noticed fire erupting from the ground. "So you're ready huh?" He asked, pulling fire from the eruption, leaping back into the air and shooting a 20ft ball of fire, with a flick of his wrist the ball explodes, knocking both fighters back an inch. "Well then." He said holding his blade in a reverse grip hold and the palm of his hand on the back of his blade, that stance had meaning but only he knew what it meant. "Let's go!" Jin goes on the attack once again, hitting him with a water attack, his limb body showed no expression, he was too busy to worry about him. He called off the Jukan and shunpoed back to his spot. Jammed his swords in the ground again and waited for the boy to Come out of it. Hopefully with his Bankai..
Jinjako began to meditate as well. He power pulsating... The dome began to get more intense, lightning crashed around jinjako. Inhaling the flames he rushes in, blocking a punch, locking Ues head with his legs and twisting his body, throwing him to his back. While in the middle of his take down he throws a backhand at Asura's face, if he wasn't so quick witted he may of actually hit him. "You tried." He said as he threw Ren over his shoulder, recovering mid way he grabbed him by arm. "Shakkaho," A red ball of kid struck both of them, colliding with and blasting the two apart. "That's dirty and you know it, but we'll make you pay for that." As they attacked Ren threw the first med-high kick, and as he went to use his spinning kick Asura swooped under and clobbered the opposite side that he was going for. Their attack ended up sandwiching his face between a foot and a fist, dazing him. "Go." Mirroring each other they cocked back and swung a punch with all their might. The new guy went flying across the inner world, tumbling along the heated ground, but he wasn't finished. As a way to make sure he stayed down for a while Asura stomped the ground causing fire to explode from the fire floor beneath the guy. As he flung into the air Ren shunpoed above him, punching his face downward while his temporary partner went to kick the other side of his face upward. They repeated the attacks three times before both appearing above him and team pummeling him back down. "Alright, just you and me." Asu spoke boldly. "And here I thought you and I might of warmed up to me." "I warm up to no one, I only burn them up." Block the blaze of fire he jumped out when it turned blue and he noticed that there was something different other than the fire's color. It was as if he jumped up to a new level in power, he felt a different presence in a way. "Weellll, COME OON!" He yelled in all caps, his skin turned darker, the very ground beneath him even changed in color. "Alright, let's--" Being cut off by a powerful punch that he intercepted he doubled back and failed to kick hi in the ribs. As the battle within his world took place any watchful eye could see fire shooting out of his body at random. Jinjako sit there, concentrating on keeping his Inner power at bay. The lighting crashed even worse now. water began to rise and stay in mid air around him. He could feel Rensakus heat, and he knew he was close to obtaiing it. 'Another time, I'll kick your *ss another day, silver hair rouge.' Asura responded, his presence than disappeared from his mind. There, I'm done... he said as he properly sits upright, that was the least he could do. His eye sight was still near but he could atleast see for the most part. "I think it's about high time you and I had a break to be honest.." He said as he woke up enough to rise to his feet though he hadn't a clue about where he was going. It struck him as a good idea to head strait to his old home, but there were too many bad memories, so he figured it'd be best if he just went to the squad barracks instead, but he'd have to wait for the dome to drop. Though he knew it would be impossible he decides to walk through the dome walls anyway, attempting to walk by he's instantly stopped and electrocuted, though it didn't hurt him. 'This isn't working,' he thought as he placed his hand on the dome, he waited patently to be released as the electricity surged through him. Jinjako felt Rensaku awake, he then spoke. Jinjako then waved his hand and the done of water slowly disappeared into the ground. Rensakus training had been completed.